Calling forth the unfathomable powers of these natural beasts, the people of ancient Ireland used the symbolism of animals to make sense of the otherwise incomprehensible natural cycles of the Earth. The Irish Celts looked to the beasts of the earth, sky, and sea to find teachers, friends, and healers. Along with this fascination and almost worship of animal symbols, the Irish Celts revered Nature itself, be it in the form of plants, animals, or elements. They believed the animals were there to teach us how to live in harmony with Nature itself. Through animal symbols, the Irish Celts sought to commune with both the seen and the Unseen. Celtic animal designs took a myriad of forms and meaning. The graceful curves of the crane. The stalwart might of the bull. The slow, coiled menace of the snake. The early Celts believed the animals arose from the fantastic Otherworld whence come the elves and fairies. We can see this tie to Nature not only in early Celtic crafts, but also in later Irish art. In the greatest example of medieval illuminated manuscripts, the Book of Kells, the four Evangelists were frequently depicted as Celtic animal symbols: Matthew the man, Mark the lion, Luke the calf, and John as the eagle. Elite Irish families used animal symbolism on their Coats of Arms. Pubs often took their names from animals renowned for their strength. Today, Irish coins are minted with animal symbols such as peacocks, salmon, and stags on their faces. Groundhog Day first arose from Imbolc -- the ancient Celtic celebration of the world awakening from its winter slumber. The snake was a complex animal symbol calling forth many ideas to the Celts. Representing the process of creation, rebirth, fertility, and healing. Serpents also represented the connection between the rivers and seas as well as the Heavens and Earth. The Celtic snake both protected the entrance to the Otherworld and acted as the gods' companion. Ouroboros, the Earth Serpent represented the coiled energy within the Earth and, with her tail in her mouth, infinity. Thanks to the annual shedding of its skin, the snake was the Celtic animal symbolizing the cyclical nature of life. Horses are the most common animal symbols used by Celtic noblemen in battle. These companions of the gods were known for their beauty, speed, vitality, and fertility. Celtic horses were linked to the night, mystery, and magic. Indeed, the term nightmare is taken from the word "mare", meaning female horse. The Celts believed that nightmares were brought to the dreamer by a visiting horse from either Epona or Mare. Horses were frequently sacrificed, yet highly adored by the Celts for their intimate relationship with the land. Some of the most enduring examples of Celtic art are the huge carvings of horses found in cliff sides around Europe. The deer was the oldest creature in existence according to the Celts. The stag was particularly associated with Cernnunos, the horned god of nature and hunting. The doe was the totem of most woodland goddesses, such as Saba and Flidais. This Celtic animal symbol was used to represent fertility, abundance, and renewal. The antlers were often associated with trees and the sowing and harvesting of grain. These faithful protectors were the Celtic animal symbols of loyalty, devotion, and unwavering faith and love. 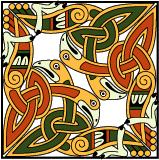 Birds are one of the most complex groups of the Celtic animal symbols. With the wide variety of birds that can be seen, the meaning is often wrapped up in the particular type of bird. To understand the birds as Celtic animal symbols, one must understand the characteristics of each particular bird. Crows: The crow was associated with death. Ravens: The raven also called forth the idea of death, but was also used by the Druids in augury, and flew over Celtic battlefields as a god incarnate. Eagles: The fearsome, glowering eagle was associated with both nobility and death. Peacocks: The peacock was a symbol of purity. Cranes: Thanks to several myths of heroic figures or deities being turned into cranes, these birds came to represent an apparent, but not real change and are often called for as signs of punishment for deception. Herons: The heron, because it mated for life, was often used on Celtic wedding bands. Ouzels: The ouzel was known for being a small but tenacious protector of itself and its flock. Salmon: The salmon was the symbol of all knowledge. These creatures that swam the rivers and oceans were also linked to sacred ancient mysteries and deep emotion. Celtic animal symbolism arises from an abundant body of lore, tale, and song and draw upon a mythology as old as that of Greece or Rome. Indeed, Celtic animals symbols are not insignificant slices of distant history, but a living link extending from the ancient Celts to the Irish people of today. When one admires Celtic animal symbols, one must remember that they are exactly what they say they are: symbols. They are not inserted for mere adornment; they are there to represent those aspects of each animal that the Celts honored. To understand Celtic animal symbolism is to understand the art and what the artist was attempting to bring across in his work. By seeking to understand Celtic animal symbols, we seek to understand the Celtic relationship to Nature and the Divine. between the ancients and all generations to come. Aidan Meehan provides an historical overview of Celtic animal symbols as well as basic instruction for the beginning Celtic artist on how to create designs which pay tribute to their original inspirations. Several of Meehan's books about Celtic Designs grace my cluttered bookshelf, but this is the one for a study of Celtic Animal Symbols. Few Celtic art scholars give these important Celtic symbols much attention. Actually the online store for Joseph Keane, an artist who designs Celtic jewelry and gifts, but he has a great section on his site offering information about Celtic animal symbolism. Internationally-renowned Celtic artist Cari Buziak offers truly outstanding work, including over 850 FREE clip art designs and cross stitch patterns, including a wide variety of Celtic animal clip art. Her designs are much richer than most found on the web. Aon-Celtic.com is also a great Celtic art resource both for learning about the history and evolution of the Celtic art. An extensive collection of Celtic web graphics, clipart and desktop art. I especially love her stained glass and 3-D effects. The Celtic snake graphic at the top of the page is just one example of her excellent work.